How easy is it for you to find what you need from your bin storage? Additionally, how much time do you think you spend looking through individual bins? Lastly, how much space do you think these bins use? 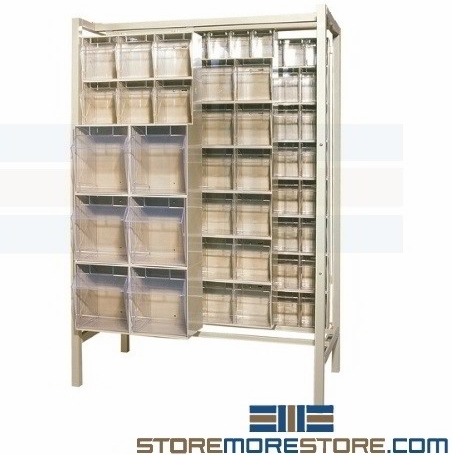 Sliding tip-out bin shelving saves space and makes it easier than ever to find what you need quickly and efficiently. This high-density system provides more storage space for small and medium parts in a smaller footprint. Bin shelves mount to floor tracks, which allows users to move individual units side to side. Why is this important? Because this allows you to eliminate the extra space needed between rows of shelves, most of which aren’t even being used for a majority of the time. The shelves are placed one in front of the other, and users slide the units side to side to access the unit they need when they need it. With the tip-out clear bins, it’s easy to identify stored parts without removing the entire bin. Each bin tips out to a 45-degree angle and can be removed if needed to fill or clean the bins. And while most bin storage systems don’t utilize space effectively (there is often extra space on the shelves due to varying bin sizes), the tip-out bins are sized to fit within the shelves perfectly without any wasted space. 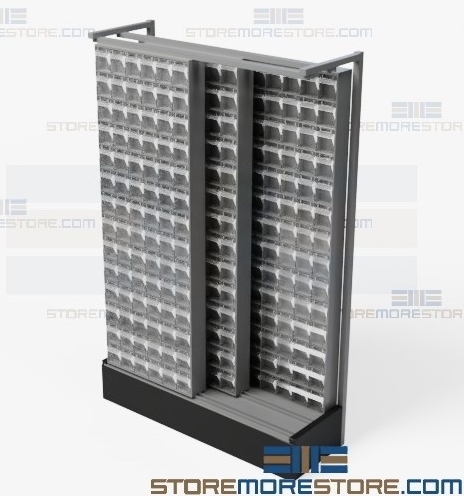 Sliding bin shelving is available to buy online and ships within 10-15 business days. Free dock-to-dock shipping included. If you need any assistance or just want some help picking the right solution for you, please call us at 1-855-786-7667.